Is It Healthier To Eat More Fresh Tomatoes Or Tomato Sauce? There are two types of tomato sauce - one that is used as a cooking ingredient and the other served with noodles, meat or pasta. Tomato has immense health benefits as one serving contains potassium, vitamins A, C, and K, fiber, and other valuable nutrients. Tomato though botanically a fruit, is categorized as a vegetable. Tomato sauce or tomato ketchup is made from fresh tomatoes. There are two types of tomato sauce - one that is used as a cooking ingredient and the other served with noodles, meat or pasta. But, is it healthier to eat fresh tomatoes or have tomato sauce? The chromium in the vegetable regulates blood sugar. Tomatoes are rich in vitamin C that helps with insulin and glucose balance. Regular intake of tomatoes can reduce the risk of diabetes. It contains vitamin K, calcium, and lycopene that strengthen the bones. Lycopene is responsible for the rich red color of the tomato. This antioxidant reduces cell damage. Studies reveal that it can reduce the risk of prostate cancer. Lycopene is the magic ingredient in the tomato that offers a host of health benefits. 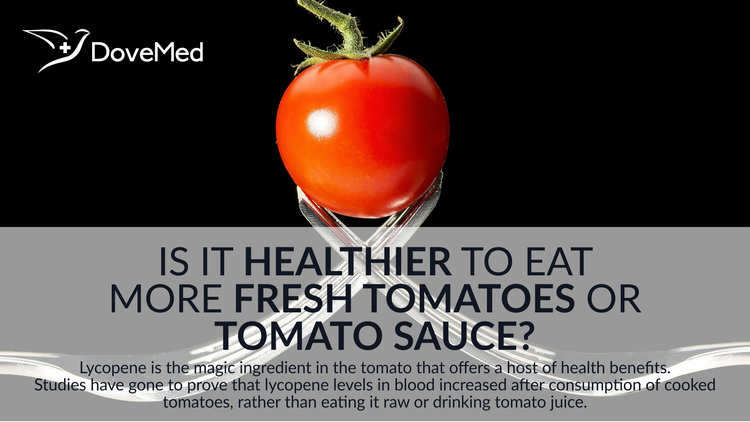 Studies have gone to prove that lycopene levels in blood increased after consumption of cooked tomatoes, rather than eating it raw or drinking tomato juice. It goes to prove that tomato sauce or tomato puree is readily absorbed by the body than fresh tomatoes. Consuming tomatoes sautéed in oil or fat can aid in more absorption of lycopene in the intestine. Tomato juice balances the alkaline levels in the bloodstream and provides resistance against diseases. The juice is rich in potassium and iron. Half-ripe tomatoes can control dyspepsia, dysentery, and diarrhea, as it stimulates torpid liver. It can also provide relief from liver problems. Half-ripe tomatoes taken during summers can help prevent heat stroke. Fresh tomatoes can reduce heartburn, indigestion, and flatulence. Tomato has uric acid lowering effect and experts recommend tomatoes to gallbladder patients, despite the content of purine and oxalic acid in it. Researchers from the Harvard School of Public Health who studied 39,000 women who followed Mediterranean diet concluded that these women had lower risks of cancer and heart disease. This was attributed to the consumption of olive oil and tomato-based products. It was noted that tomato sauce particularly reduced the risk of cardiovascular diseases. Another study from Marseille, France reveals that the tomato peels included in the tomato sauce or paste had a high concentration of carotenoids that increases the health benefits. Tomatoes, whether taken half-ripe, fresh, or in the form of sauce, puree, juice or ketchup, the benefits of tomato are immense, which goes to prove that it is an indispensable ingredient in many types of food across the globe. Campbell JK, Canene-Adams K, Lindshield BL, Boileau TW, Clinton SK, Erdman JW Jr. Tomato phytochemicals and prostate cancer risk. J Nutr. 2004; 134:3486S-3492S. Etminan M, Takkouche B, Caamano-Isorna F. The role of tomato products and lycopene in the prevention of prostate cancer: a meta-analysis of observational studies. Cancer Epidemiol Biomarkers Prev. 2004;13:340-345. Giovannucci E. Tomato products, lycopene, and prostate cancer: a review of the epidemiological literature. J Nutr. 2005. Aug;135(8):2030S-1S. Goodman M, Bostick RM, Ward KC, et al. Lycopene intake and prostate cancer risk: effect modification by plasma antioxidants and the XRCC1 genotype. Nutrition & Cancer.2006;55:13-20. Silaste ML, Alfthan G, Aro A et al. Tomato juicedecreases LDL cholesterol levels and increases LDLresistence ot oxidation. Br J Nutr 2007; 98: 1251-1258. Borguini, R. G., & Ferraz Da Silva Torres, E. A. (2009). Tomatoes and tomato products as dietary sources of antioxidants. Food Reviews International, 25(4), 313-325. Beecher, G. R. (1998). Nutrient content of tomatoes and tomato products. Proceedings of the Society for Experimental Biology and Medicine, 218(2), 98-100.